864 pages, in three volumes, of US Navy history of the Civil War, by the U.S. Navy. Three volumes published between 1883 and 1885, by Daniel Ammen, Rear Admiral U.S. Navy, A. T. Mahan, Commander U.S. Navy, and James Russell Soley, Professor U.S. Navy. 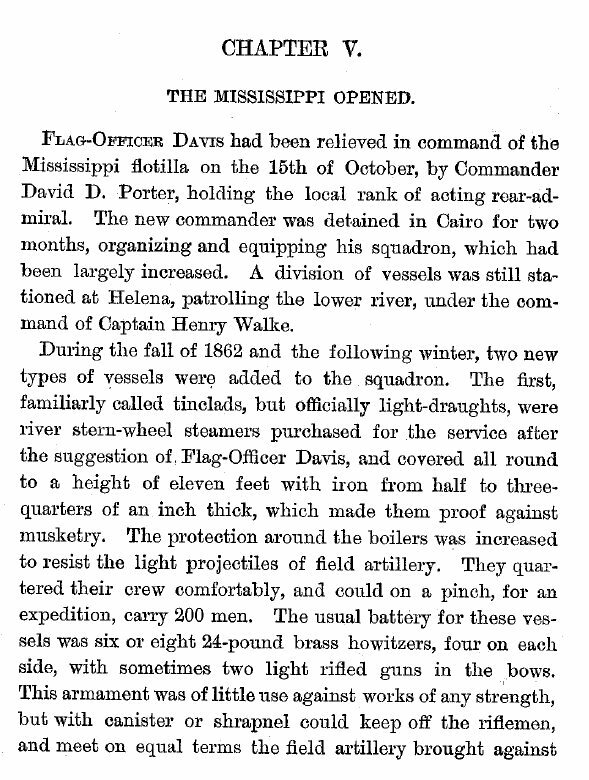 Navy in the Civil War, Volume I. The Blockade and the Cruisers. 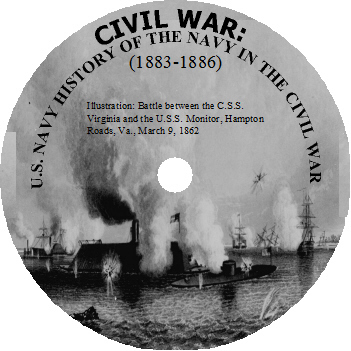 Volume I of three parts, it includes the naval situation at the start of the Civil War, focusing on the tactic of naval blockade squadrons located in the Atlantic, Chesapeake, and Gulf. Also covered are the operations of commerce-destroyers and privateering. Contains appendix with listings of vessels and their fate. Indexed. Seven maps. From the preface: "As the introductory volume of a series, it is the purpose of this book to deal not only with the specific subjects mentioned in the title, but also with the general condition of the Navy at the outbreak of the War, the peculiar difficulties before it, and the way in which the difficulties were met. In this connection it has been necessary to touch incidentally upon matters that are the subject of animated controversy in the Navy at the present moment. Such a reference to actual questions cannot be avoided, if the lessons of the War are to be fairly and fearlessly regarded. For statements of fact, reliance has been chiefly placed upon the written accounts, official or unofficial, of those who took part in the events recorded. 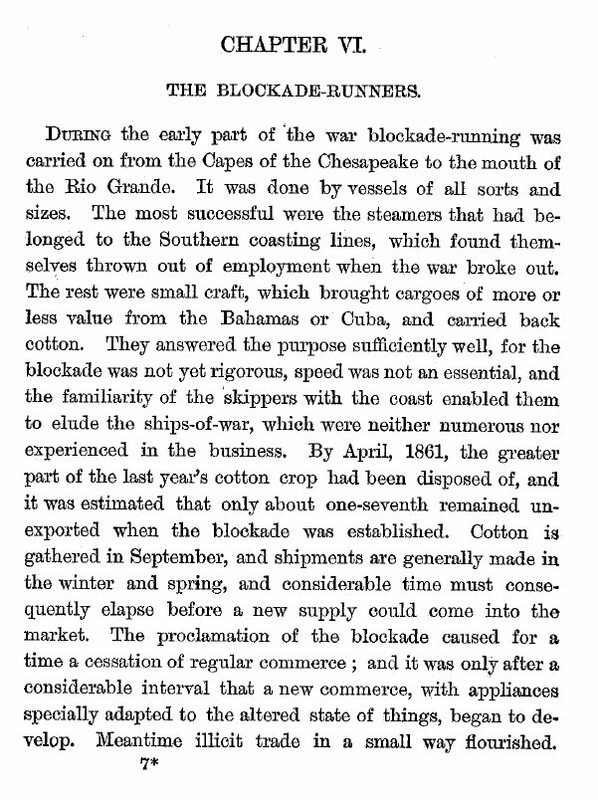 In describing the operations of the blockade-runners, the narratives of Maffitt, Roberts, and Wilkinson have been largely used." 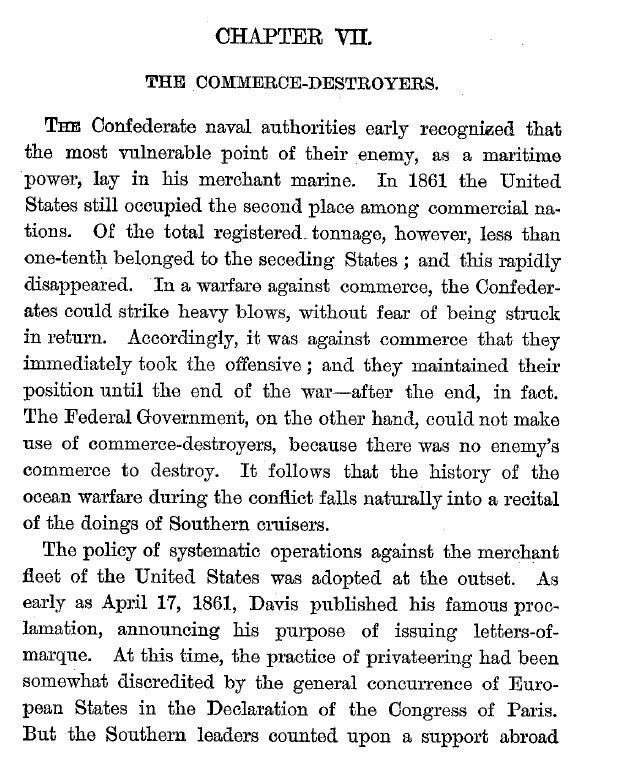 Navy in the Civil War, Volume II. The Atlantic Coast. Volume II of three parts, tells the condition of the navy at the beginning of the Civil War and consists of the naval operations between Cape Hatteras to Cape Florida conducted in the sounds, rivers, and harbors along the Atlantic coast. Specifically Port Royal, Fort McAllister, Charleston, and Fort Fisher operations are detailed. 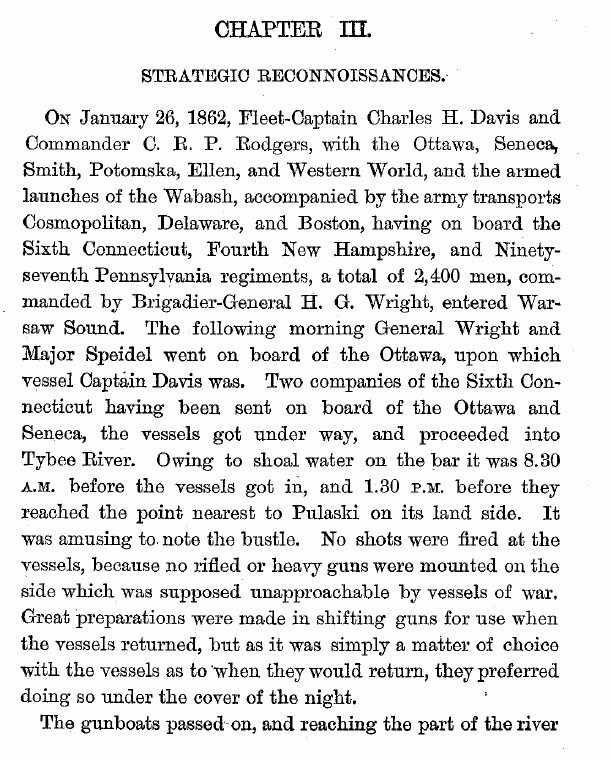 Appendix contains lists of vessels engaged during operations. Indexed, 9 maps. Navy in the Civil War, Volume III. The Gulf and Inland Waters. Volume III of three parts, contains description of naval operations and battles along the gulf coast, the Mississippi River, at Vicksburg, at New Orleans, at Mobile, and along the Red River. Appendix lists the vessels stationed at various battles. Indexed with 8 maps. From the preface: "The narrative in these pages follows chiefly the official reports, and it is believed will not be found to conflict seriously with them. Official reports, however, are liable to errors of statement and especially to the omission of facts, well known to the writer but not always to the reader, the want of which is seriously felt when the attempt is made not only to tell the gross results but to detail the steps that led to them. Such omissions, which are especially frequent in the earlier reports of the Civil War, the author has tried to supply by questions put, principally by letter, to surviving witnesses. A few have neglected to answer, and on those points he has been obliged, with some embarrassment, to depend on his own judgment upon the circumstances of the case; but by far the greater part of the officers addressed, both Union and Confederate, have replied very freely."